That was not only Chamberlain’s theory – you know, like we all say the cliches about how we should be running our lives. He actually lived by that awareness, and deliberately cultivated “habit and cherished thought” throughout his adult years. What a nerd. What pompous self-awareness and self-respect! This statement of his is a defense of (among many other things) how he was so ready to do the necessary things to save the Union south flank (and perhaps the whole battle) at Gettysburg, PA, in that chaotic, brutal, and crucial battle in July of 1863. No-one knew what particular tactics would be required. No one knew what strategies or risks he should invest himself and his troops in. No one knew. He was assigned there partly because he had demonstrated the kind of self-mastery, intelligence, courage, awareness, connection with his troops, etc. that would hopefully stand the Union forces in good stead on that horrible day. It worked. It was, as human life always is, partly luck. But as they say, “luck favors the prepared mind.” He had worked hard and consistently to have a prepared mind (and emotions, etc.). So his remark quoted above is first person testimony from experience. He did what he had prepared to do – though he was thrust into a wild scenario where no-one knew what he should do. He was ready for the unknown and the unexpected. And that’s why he said that. Don’t imagine he was unusually lucky. Don’t imagine he was unusually favored by God or “the gods of war.” He was doing what he had prepared himself to do. He was frequently wounded, pretty seriously, but survived to be the commander of the reviewing troops when Lee surrendered at Appomattox two years later. He went on to be a college President, and Governor of Maine. And all along he worked to keep himself ready and available to see and do what was most needed. 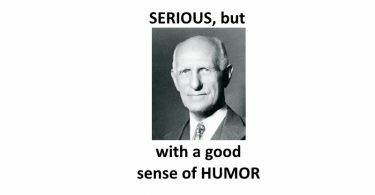 What are OUR “habit(s) and cherished thought(s)”? Because those daily practices will provide a strong clue as to how we will perform in the more demanding situations that will almost surely come. 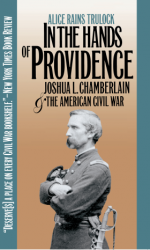 In The Hands of Providence: Joshua L Chamberlain and the American Civil War, by Alice Rains Trulock. Univ of No Carolina Press. 2001. I have gone through this book a couple of times. It develops a strong feel for the war, for Chamberlain, and even for the aftermath. Alice Rains Trulock. Joshua Lawrence Chamberlain.